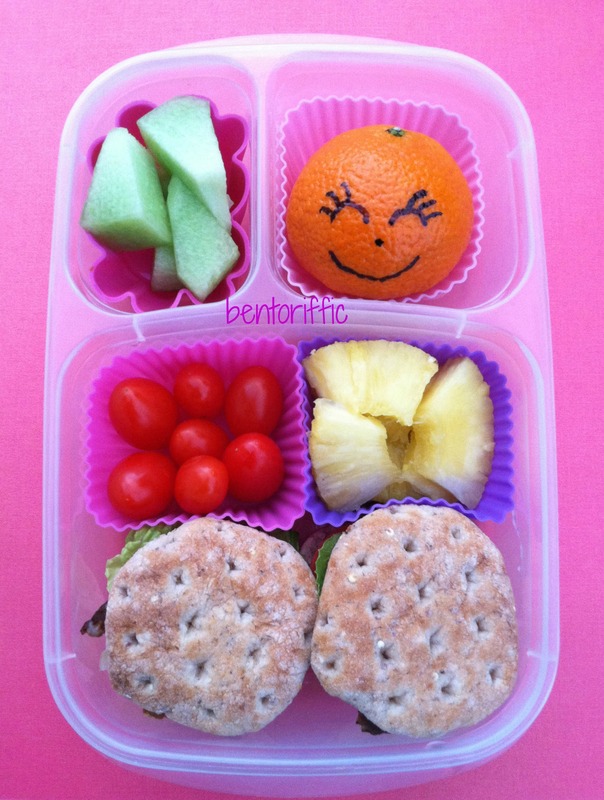 It’s a rainy, cooler day here in Florida today so there’s some sunshine inside the lunchbox. I made Miss G some vegan BLTs for lunch. I found these mini slider buns at Whole Foods in the bread section, and they’re they perfect size for preschool lunches. I cooked some vegan tempeh (fermented soy) bacon. 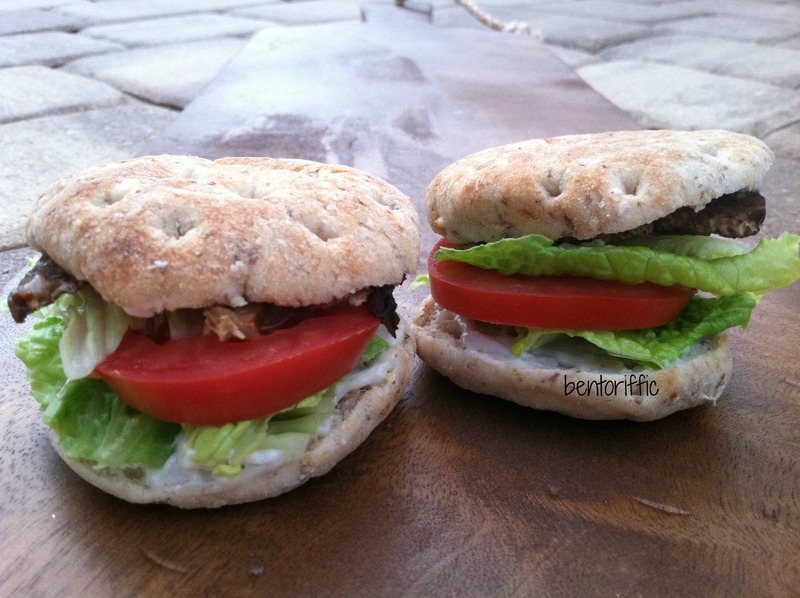 I use a tiny bit of Earth Balance vegan mayo on the bun, then romaine leaves and sliced tomatoes. 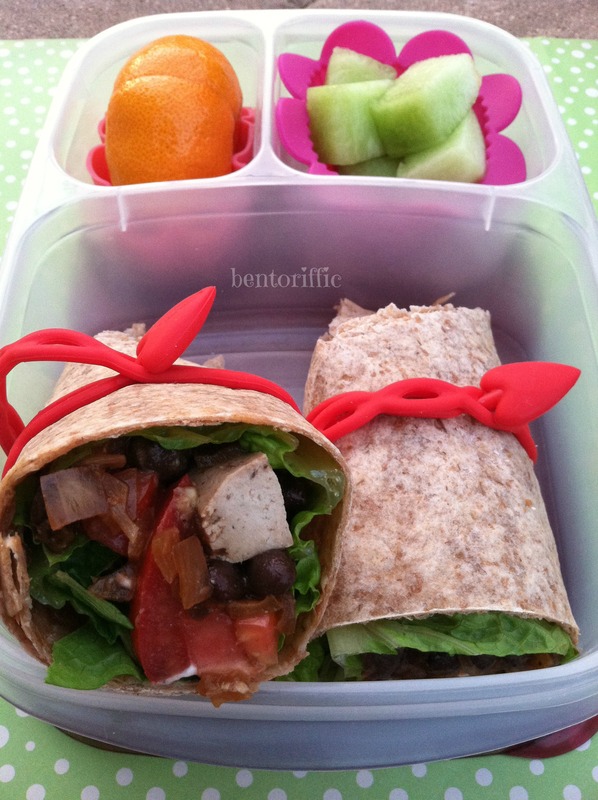 Above the mini sandwiches are grape tomatoes and pineapple pieces. 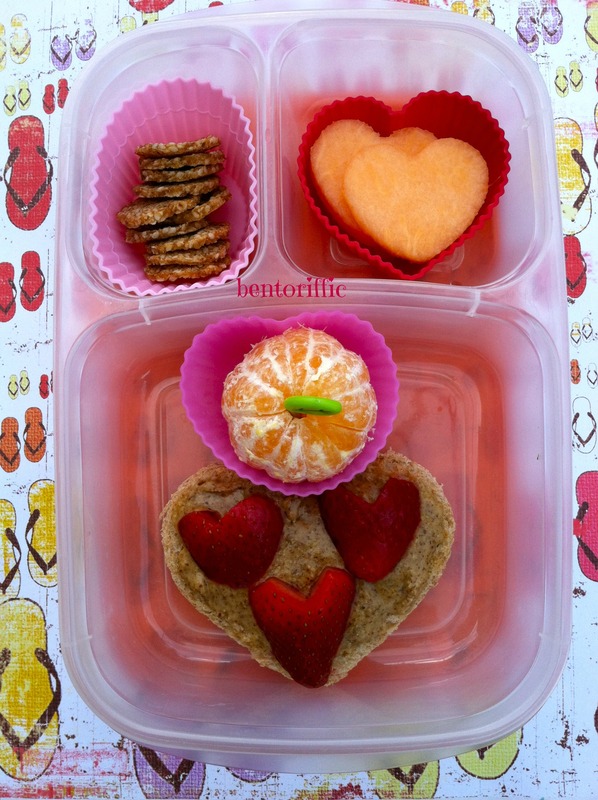 In the top left of her Easy Lunchboxes container are honeydew melon pieces and in the top right is a sunshiny face clementine. My girls also love sliced avocado or guacamole on their BLTs. 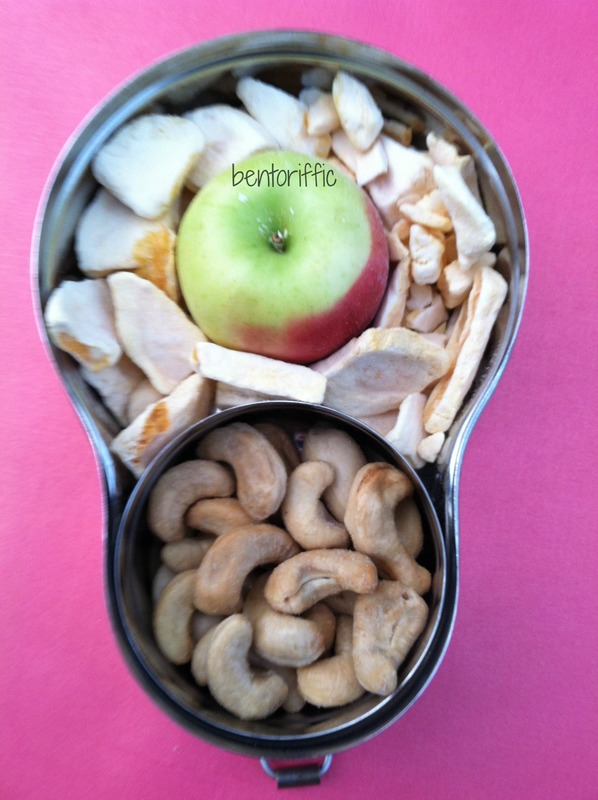 Miss G’s snack today is freeze dried mango pieces, a Crimson Gold organic apple and roasted cashews in her Happy Tiffin stainless bento box. Vroom! Miss A is off with her LunchBots Quad filled with cars. From the top left are pineapple pieces with 2 honeydew melon cars on top. In the top right is chickpea hummus with a pita bread car on top. In the bottom right corner are honeydew melon pieces with dried apricot cars on top, and in the bottom left are Laurel Hill brand peace sign pretzels for dipping and mini carrots. 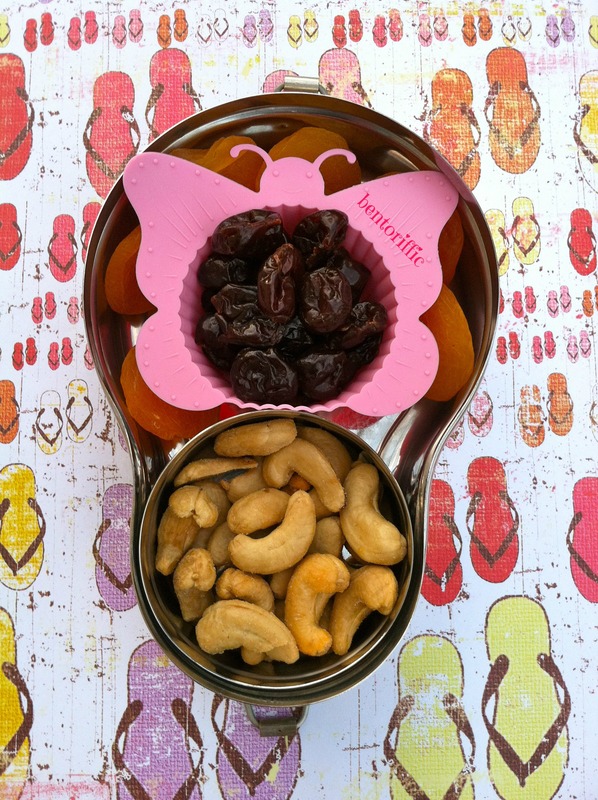 The snack bento of the day is cashews, a small organic apple and purple sweet potato chips in her Happy Tiffin stainless bento box. 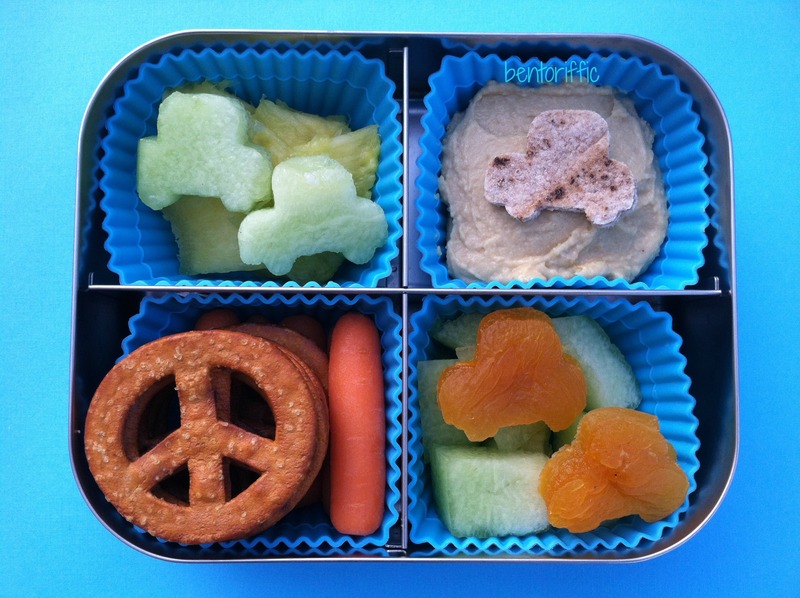 My littlest munchkin has a holly lunch today in her LunchBots Quad. From the top left she has organic raspberries with a mitten ring. In between the cups are 2 dried apricots and a Hail Merry brand raw macaroon, cashews in the top right with a holly food pick, organic blueberries and three small holly sandwiches on Rudi’s Organic whole grain bread made with a small cookie cutter stamp. I packed this fruit and grain snack box to go with my husband’s lunch. In the top compartments are festive colored cous cous and dried cranberries. In the bottom of his Easy LunchBoxes are raspberries, mixed grain and walnut salad, a local organic Florida tangerine and a mini apple. Happy Holidays! This is week one of the Bento Bloggers & Friends festive holiday hop. Please be sure to click on the button at the end of the post to see the next fun lunches. Packed in her Easy Lunchboxes container are some ornament sandwiches on Rudi’s Organic Whole Grain bread. She has 2 Christmas tree picks of blueberries in between and tomatoes around the sandwiches. In the top left are ornament shaped honeydew melon pieces with a Christmas light pick and in the top right are organic raspberries. 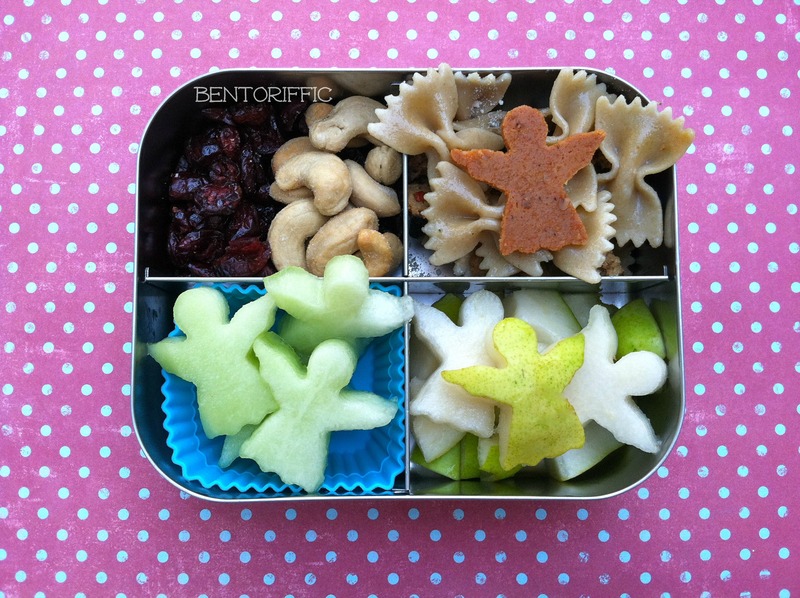 In her Happy Tiffin stainless bento are a candy cane apple cutout surrounded by purple sweet potato chips and whole cashews in the round container at the bottom. Little sis has the mini version of ornaments on Rudi’s Whole Grain bread. She also has purple sweet potato chips, honeydew pieces with a candy cane apple on top and berries with a honeydew ornament on top. PLEASE CLICK ON THE BUTTON BELOW TO SEE WHAT KANDICE AT WE AREN’T SCARED OF SUGAR MADE FOR HER LITTLE ONE! My dad died last week. Just as I was typing away about the things I was grateful for last week, I realize now that the small things, tiny things we think are so insignificant can sometimes be the most precious memories. My dad was a gifted writer and storyteller. He loved to write and shared that love with me. My dad read my blog. I think he appreciated that I was using my writing and creativity, making a hobby out of it and feeding my kids healthy food. I live 3400 miles from my family so I was not there for this holiday. All my siblings were fortunate enough to be there. He had been ill for a while, but it doesn’t make his passing any easier. I did have the chance to talk to him to say hi, catch up for a minute and to tell him I loved him the day he died. And for that I am truly grateful. The conversation was nothing significant, but it is one I will always remember since it was our last. Today, more than most, I am grateful for the time I had with my dad. Life is fragile and fleeting so be sure to stop and appreciate all the gifts in your life, no matter how small they seem. My 4 year old daughter had an Easy LunchBoxes container filled with angels. From the top left are pear pieces and angel shaped pears. In the top right compartment are honeydew angels. 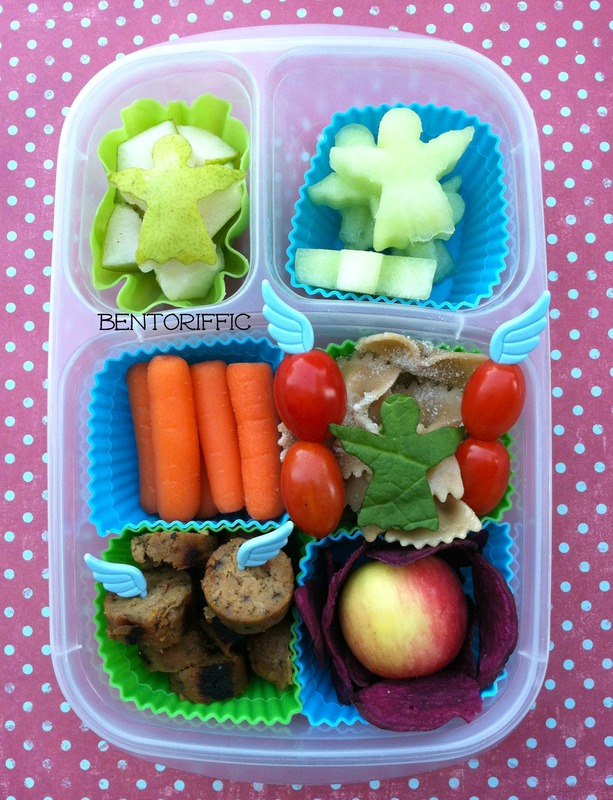 And in the main compartment are carrots, farfalle pasta with vegan parmesan sprinkled on top, grape tomatoes on wing bento picks and a spinach angel on top. In the bottom right corner is a Crimson Gold apple surrounded by purple sweet potato chips and in the bottom left corner are Field Grain veggie sausages with wing food picks. 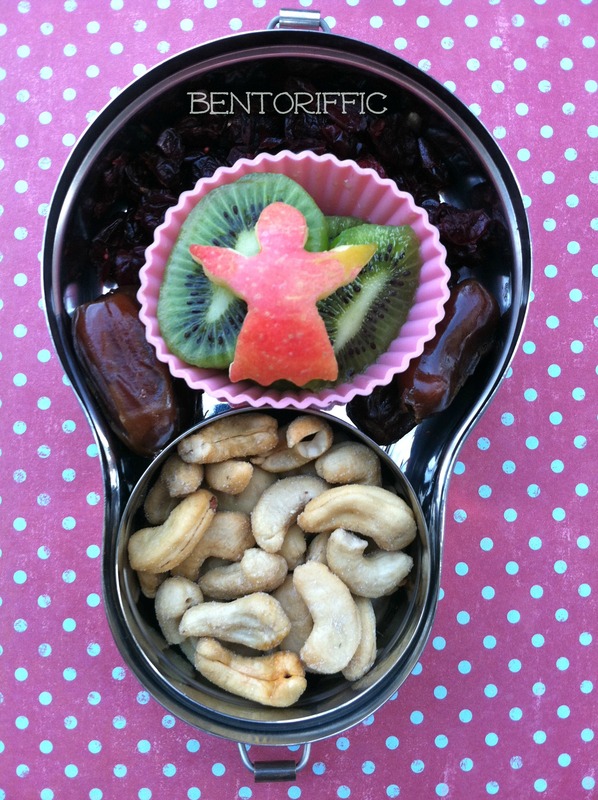 For her snack today, Miss G has a Happy Tiffin brand stainless bento box filled with dried cranberries, medjool dates, sliced kiwi, and apple angel and whole cashews. 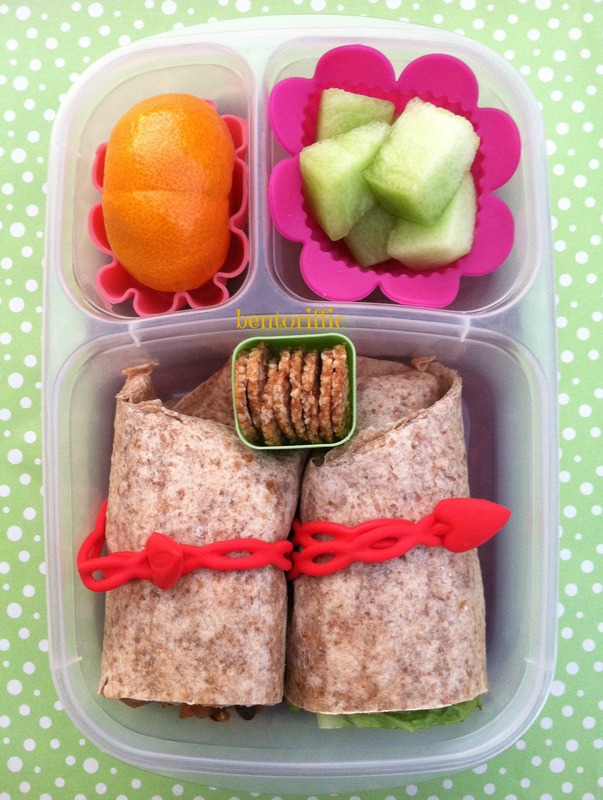 Miss 2 year old is back to school this week to with a LunchBots Quad stainless container. From the top left she has dried cranberries, cashews, farfalle pasta with small Field grain Italian veggie sausage pieces and a slice of Field Grain sundried tomato angel on top. In the bottom right compartment are pear angels and in the bottom left are honeydew angels. I packed my husband his daily fruits and vegetables in his Easy LunchBoxes container to go with his leftovers for lunch (not shown). He has raw walnuts, the negative cutout angel pieces of honeydew melon, mini carrots, medjool dates, an apple and a clementine. There are still 2 days left to enter my Grateful Giveaway. Please click below to enter to win 1 of 2 prizes. One of my favorite things to do when I have a moment of spare time is to find local grocers with imported foods and dive in. I have found some tiny grocers in my town hidden in small strip plazas and off the beaten path. One of my favorites is a small Asian grocer. I’ve discovered vegetable and fruits I’ve never seen, foods that aren’t normally available here and more importantly some inspiration to look at food a little differently. A few weeks ago we tried Forbidden Rice which has a heavier feel to it and is black in color. This time I found black rice pasta. It looks jet black before it’s cooked and then it takes on a purplish hue once it’s cooked. It’s gluten free, allergy friendly and makes the same old dishes more interesting. 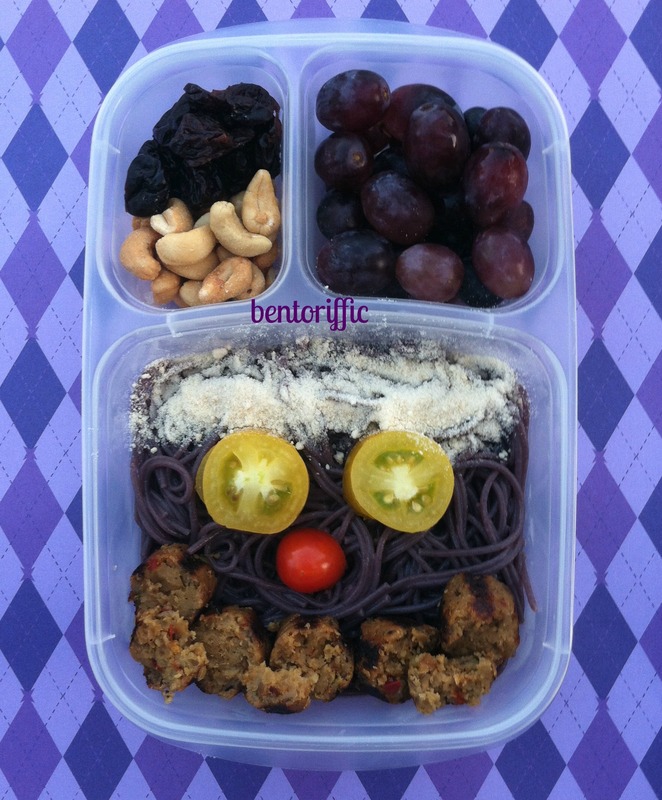 Miss G has black rice pasta mixed with a bit of Earth Balance coconut spread. I sauteed some Field Grain vegetable sausages to go with the pasta and made a face of it. The “hair” is vegan parmesan, eyes and nose are roma and grape tomatoes and the sausage pieces are the mouth. 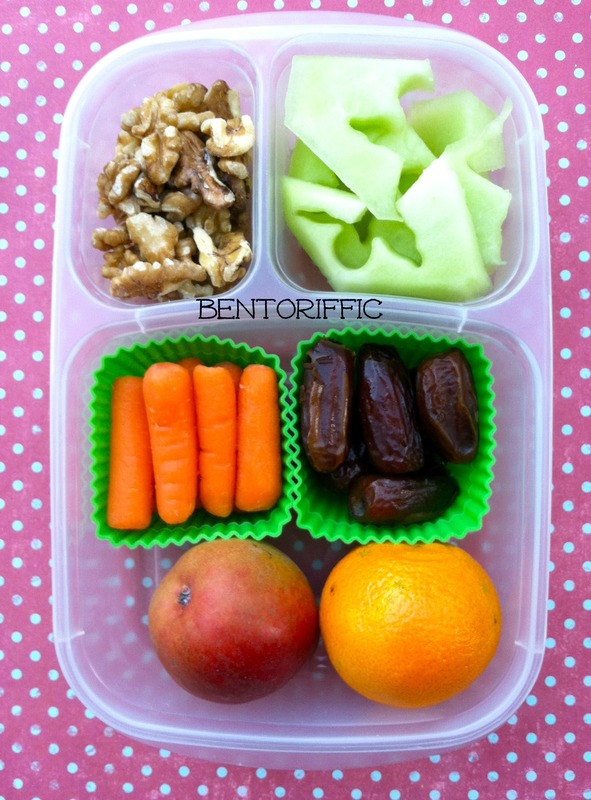 In the top left compartment are dried cherries and cashews and at the top right are black seedless grapes packed in her Easy LunchBoxes container. 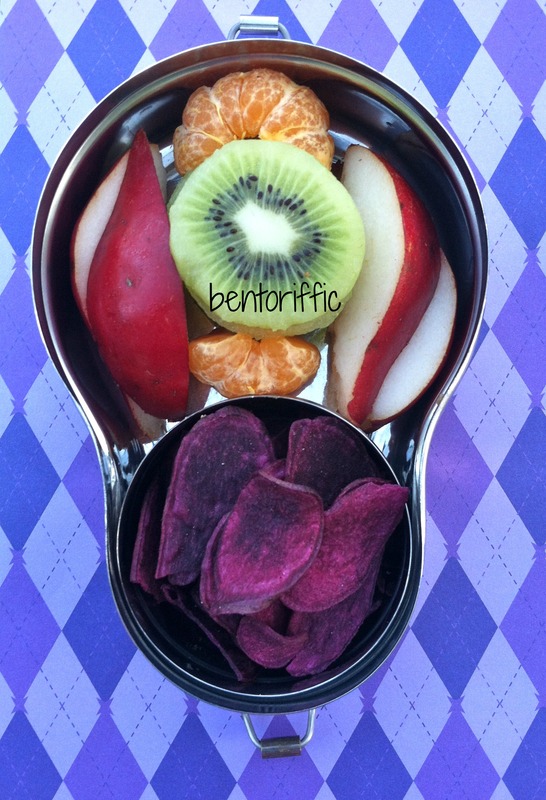 In her Happy Tiffin stainless bento are purple sweet potato chips, pear slices, clementine orange sections and sliced kiwi for her preschool snack. And my little Miss 2 year old has a LunchBots Quad. 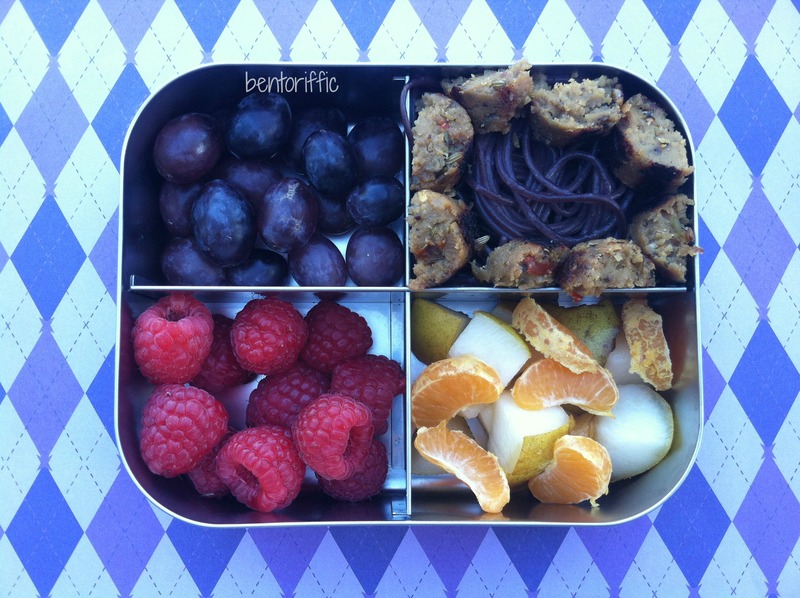 From the top left are black seedless grapes, black rice pasta and Field Grain sausage, pear and clementine pieces and raspberries for lunch.